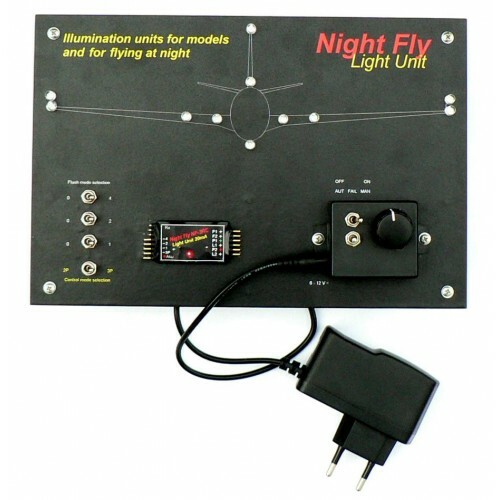 Demoboard is intended for dealers, manufacturers and retailer of aircraft models and modeling equipment to demonstrate a features of NightFly lighting control units, how does they work, how to operate the unit etc. 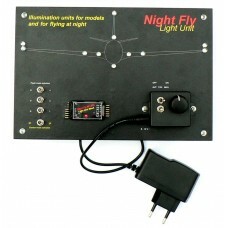 It consists of a control unit NF-3RC, simulator of receiver, power supply and an aircraft silhouette fitted with the position, flashing and landing 20 mA LED. Using demoboard you can present controlling the unit from a transmitter via a round knob. There are placed 4 switches to select the flash mode or to demonstrate how to operate lights by selecting 2 or 3-position control. They replace the jumper settings in real controllers. The board is powered by an AC adapter 9 V, 500 mA.